Always check your bank account. The post went up on 9 October. At the time of writing, the post has since received 2,700 comments and more than 9,200 shares. Although Hafifi did not share if this was a personal experience, the photo attached to the post indicates that the transfer was made to him. "The buyer says they will bank in today 9 October 2018. But when the online payment is being made, they choose 'scheduled payment' and pick the date 12 October 2018," he wrote. "After the transaction is completed, the receipt is 'screenshot' and the buyer will send that receipt to the seller as proof of payment." The 'receipt' attached to the post. Hafifi added that the receipt has "no flaws" and does not indicate that the transaction is a scheduled payment. "The most unsettling thing is the receipt has 'Successful' on it," he said. In most cases, when the seller receives the authentic-looking receipt, they will then post out the item without checking their account balance. "Once the buyer receives the tracking number, they will cancel that scheduled payment." 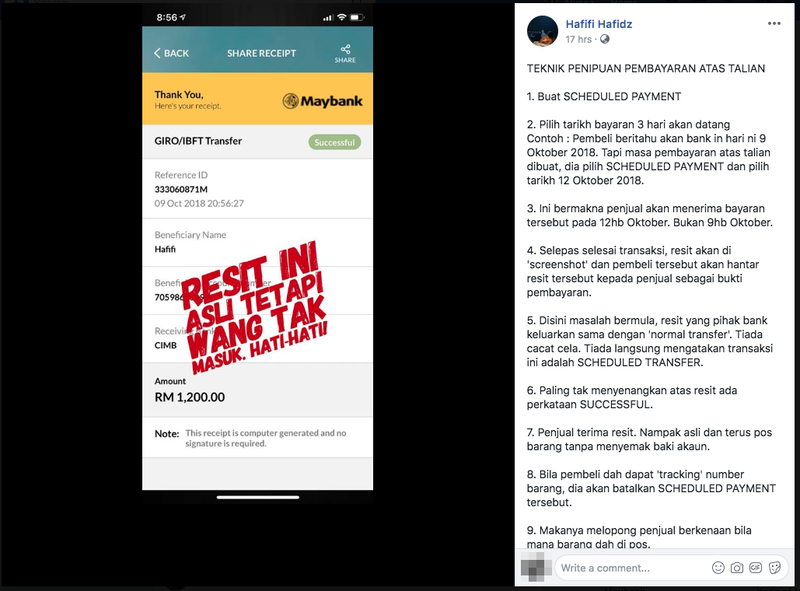 Hafifi said that not only can scheduled payments be cancelled at any time, but even if "the balance in our account is RM2, we can still make scheduled payments". "So scammers can freely place any amount they want." He added, "Even without the need to cancel the transaction, when the scheduled day arrives, if the system checks that the account balance is not enough, then the transaction will automatically cancel." Lastly, Hafifi warned all online sellers to always check their bank accounts. A screenshot of the conversation. "Generally, we would advise the account holder to check their account to confirm the payment prior to proceed with any deal/online trade with the sender," they wrote. Maybank also said the issue has been highlighted with the "respective team for an immediate action on updating the receipt content". "This is to avoid any unnecessary confusion in the future and for our customers' convenience." A screenshot of the reply. 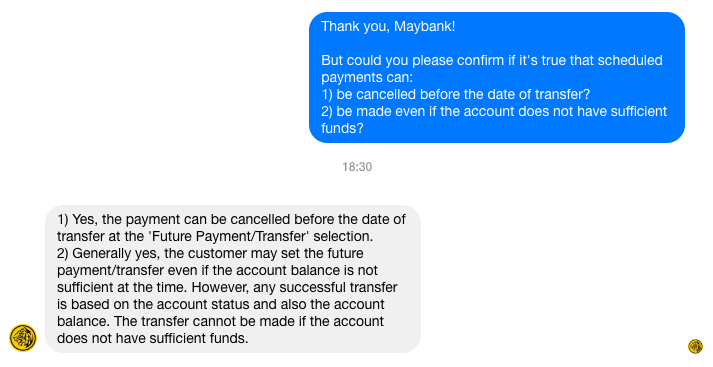 Scheduled payments can be cancelled "before the date of transfer at the 'Future Payment/Transfer' selection", wrote Maybank. They also said that customers may set future payments or transfers "even if the account balance is not sufficient at the time". "However, any successful transfer is based on the account status and also the account balance. The transfer cannot be made if the account does not have sufficient funds," explained Maybank. The Employees Provident Fund (EPF) has debunked the viral message. The parcel was sent from China. Many only found out that the tickets were fake when they were turned away at the concert venue.